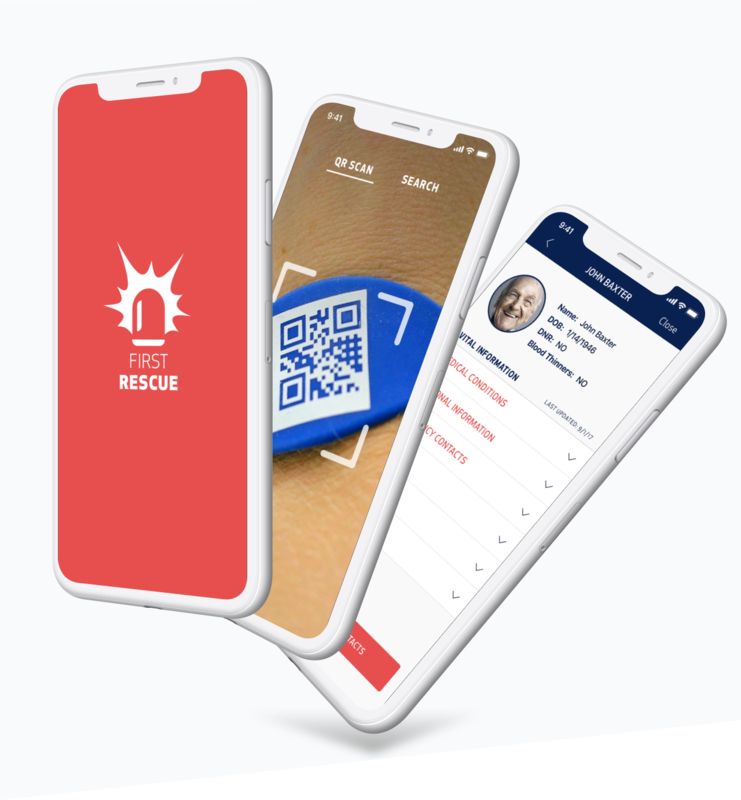 First Rescue is a HIPAA-compliant mobile app prototype designed to give emergency responders critical patient information on demand. Each second counts in an emergency medical situation, and outcomes often depend on how quickly a patient can be triaged, transported, and cared for at a hospital. Faster response times and more comprehensive emergency care are the primary goals for first responders. The next best step in providing first responders with the information they need to achieve these goals is a new tool that allows for critical patient medical information available on demand rather than only at the scene. Before administering any emergency care, EMTs typically arrive on the scene and then proceed with gaining an understanding of a patient’s current ailments, medications, and medical history. This process of understanding the patient’s condition is paramount to the success of the emergency triage care, but can also take up a good chunk of crucial time, especially if the patient is unconscious or otherwise incapacitated. About 85% of these types of medical emergencies occur among the elderly, specifically at nursing homes and other senior living facilities. And because these facilities typically maintain residents’ medical data, we chose to focus on this space. So we framed the concept as a Fitbit for Medical Records: essentially, an electronic health record (EHR) would be encrypted and stored in a wristband adorned with a QR code. In an assisted living facility, the care staff will populate and update the wristband wearer's EHR through an online portal. Facility staff can even update a patient’s medical information after they've called for care, giving the first responder the most up to date information at the time of administering care. 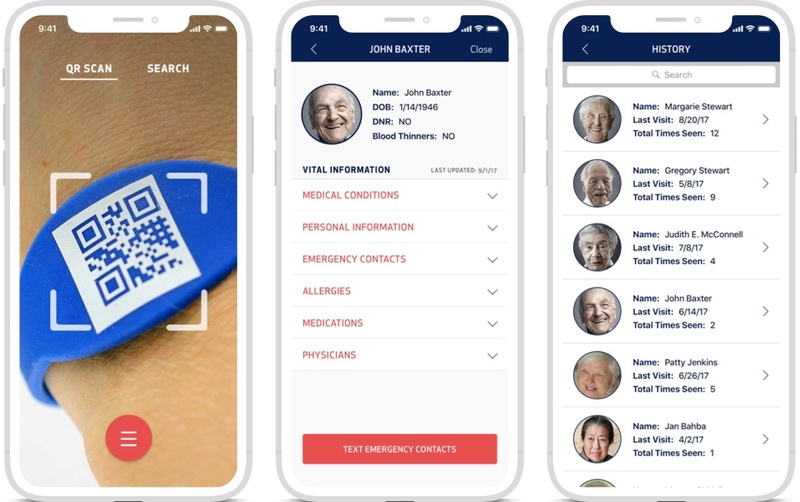 The First Rescue App accesses this information via a HIPAA compliant, and secure API upon scanning the wearable device (or searching for the patient within the app). 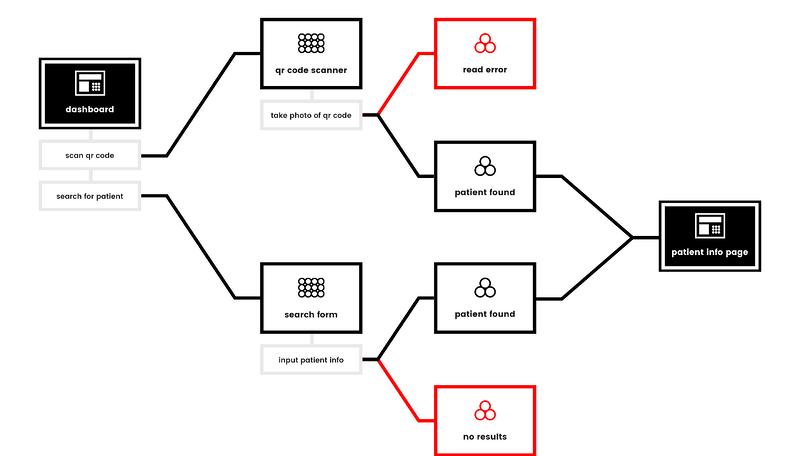 First responders verify their identification using a unique token identifier and then accesses the patient information database. The application presents the patient's history, including medical conditions, medications, physicians, emergency contacts, DNRs, etc... The first responder can quickly and easily reference this data as they triage. We started by launching a validation cycle, starting with the lean canvas: a simple template that articulates the what, how, and why of a business concept. Our lean canvas required market research into customer segments, competitors, key metrics, and channels. We also articulated our unique value proposition: the ability to make lifesaving medical information immediately accessible to first responders. We then worked with the First Rescue team to create a Needs, Wants, and Desires map. Here we decided on the most valuable features to include in our MVP prototype. After we agreed on the MVP feature set, our UX team then got to work on creating See | Do maps — a hybrid of Information Architecture (IA) and high-level user flows. All of this work then informed the first Low-Fidelity (Lo-Fi) wireframe prototype, which we ran several user tests on to validate the scan and search UX. The UX team, now armed with community informed test results, then began work on the branding, UI design, and High-Fidelity (Hi-Fi) prototype. "I was extremely impressed with Very. The app is exactly how I envisioned it would be, and the team was in constant communication with me. Everyone who’s seen the prototype so far has loved it and is eager to see it implemented." While there’s no product — yet — the prototype is an invaluable tool for First Rescue. 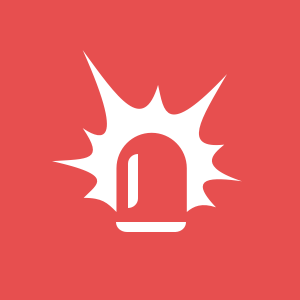 As Carlos shares the concept with investors, they’ll be able to visualize, and interact with the platform, gaining a much more complete understanding of the core features, and the value they add to a first responder’s workflow. Once funding is in place, more refinement into the UX and prototype will take place to align with business KPIs, and then we will turn the prototype into a production-ready product.